Worn by some of the most powerful women in history for near a millennium, briolette cut gemstones have stood the test of time as one of the most daring and elegant cuts. Unlike today’s brilliant cut that focuses on maximizing light from the table of a gem, the briolette is designed to be viewed from every angle. With a more delicate glow than a round brilliant cut – it’s more akin to the glow of the full moon than the sun at high noon. While briolettes are easy on the eyes, they are definitely not easy to create. Or recreate. It’s all very improvised. Like jazz, anything goes with regard to the shape. Though it’s usually a pear or tear-shaped gemstone covered with small triangular, rectangular, or rhomboid facets. Yet even here, the cutter has free rein as to the size and number of facets. Instead of crowns and tables and perfect proportions, briolette cutter’s use the original rough shape of the stone as their guide in refining the shape. The facets are positioned to free all the light locked inside the gemstone. One of the oldest cuts, it originated in India around the Twelfth century. The 90 carat briolette of India is one of the purest diamonds in the world as well as one of the oldest on record. The most powerful woman of her time, Eleanor of Aquitaine, was the first known to wear this briolette. From there it changed through some very illustrious hands such as that of King Richard the Lion Hearted. After disappearing for hundreds of years, it found its way to the jeweler Cartier in the early 1900s and then to the jeweler Harry Winston in 1950. When it was last seen, it was worn as a pendant with another diamond and a large pearl. It is currently somewhere in Europe, hopefully around some lucky girl’s neck. Some other famous gals that have loved briolettes were Catherine the Great and Marie Antoinette. Napoleon Bonaparte is known to have given his wife an absolutely gorgeous 275 carat diamond briolette necklace. This necklace now sits in the Smithsonian Institution in Washington DC. In the early part of the twentieth century, long delicate briolette pendants were very popular as were earrings. Former First Lady Jacqueline Kennedy had a swanky pair of red tourmaline briolette earrings with amethysts. Though briolettes have somewhat faded into obscurity, they have never really gone away. Cost seems to be the biggest factor when it comes to briolettes. It’s quite expensive to cut diamonds and stones like rubies or sapphires into briolettes as quite a bit of rough material is lost in the making. To create a 75 carat briolette diamond tear-drop shaped pendant, the original rough stone must be around 160 carats. 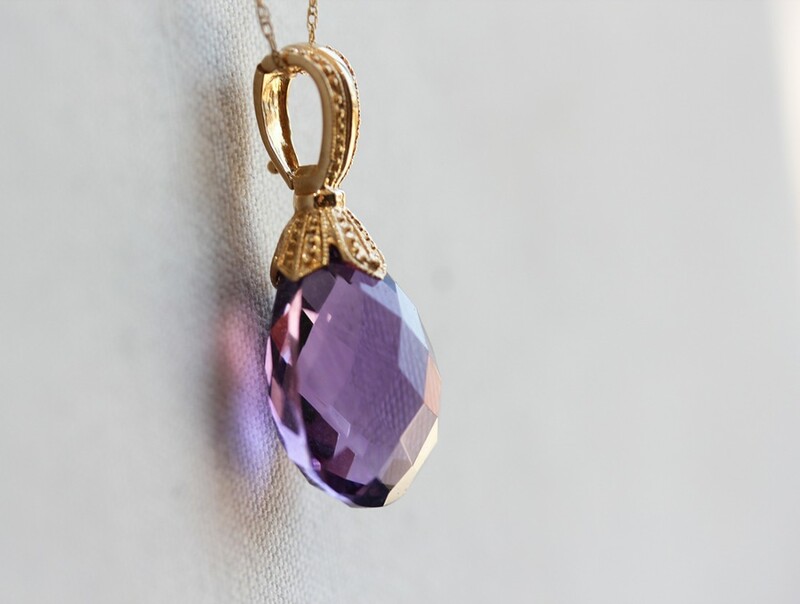 Briolette cuts can be used in any piece of jewelry but they make especially stunning pendants and earrings due to the way they dangle and catch the light. Briolette engagement rings and bracelets are gorgeous and are making a comeback as many have an appreciation for the effort it takes to create these unique masterpieces. They are definitely not something you see everywhere. While briolette diamonds were more common in past centuries, it’s more likely you’ll see other gemstones made into briolettes. While diamonds are still being used, they are much more pricy because of the painstaking effort required and how much of the original stone is lost in their creation. As the saying goes, all that is old is new again. If you want to learn more about old cuts and antique or vintage diamonds, please call 619.223.2151 to set up a time so we can discuss more about these and other timeless cuts.